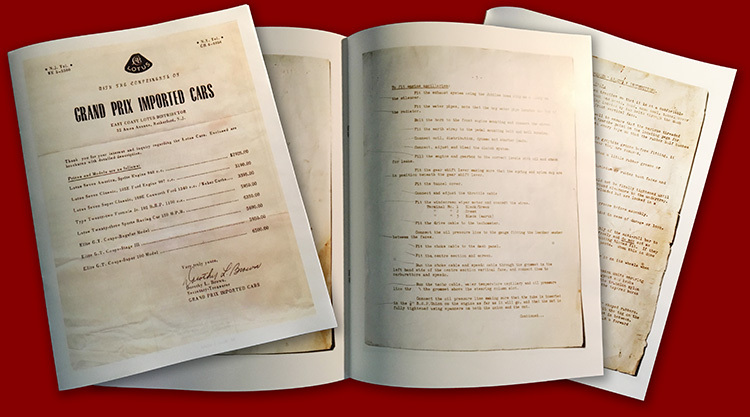 Look here to find out how you can own a reproduction of the genuine LOTUS SEVEN "AMERICA" ASSEMBLY INSTRUCTIONS as distributed by Grand Prix Imported Cars of Rutherford, New Jersey, USA! -- LOTUS SEVEN "AMERICA" ASSEMBLY INSTRUCTIONS - As presented by Grand Prix Imported Cars -- get one now! -- FRAME #1122 -- In Search of History An early S2 Seven may have raced in South Africa -- Who Knows? -- SB1946 -- Back to Original Yet another gorgeous S2 Seven is returned to its former glory! -- SB2285 -- Restoration in Progress A second owner restores a '68 S2 to original conditon. -- SB1168 -- RUNOFFS BOUND! A lifelong S2 Seven race car -- headed to the SCCA Runoffs! -- SB1478 -- FOUND! -- A beautifully restored genuine S2 Seven -- has been recovered! -- SB1587 -- PRICE DROP -- Genuine vintage race car, now detailed and price reduced! -- SB2925 -- PRICE DROP! The rare and fast SIV Seven - a beautiful example, and FOR SALE! -- 7/B1135 -- John Donohoe/aka the SimpleSevens guy, opens up about his wife's early S2 Seven! -- MK7#449 -- FOR SALE -- PRICE DROP! One of the first four USA dealer-delivered Sevens!